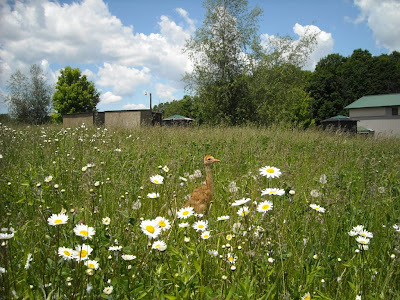 Taking Flight: Interns Birthday, Photo updates of Sandhill Cranes, Merganser and Wood Duck Ducklings, Kingfisher chick and more. 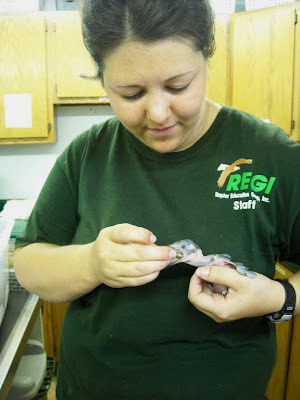 Interns Birthday, Photo updates of Sandhill Cranes, Merganser and Wood Duck Ducklings, Kingfisher chick and more. 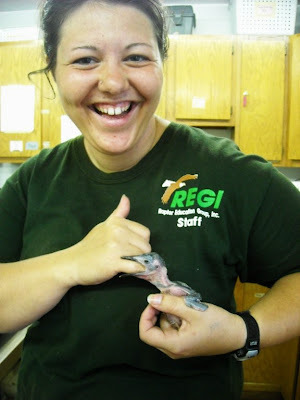 Speaking of interns Aprill is a bit of a ham and volunteered to get us duckweed from Moose Lake for our baby ducklings. Duckweed is so important to the growth and development of baby ducks, but it does not begin to grow until the water temperature warms some. 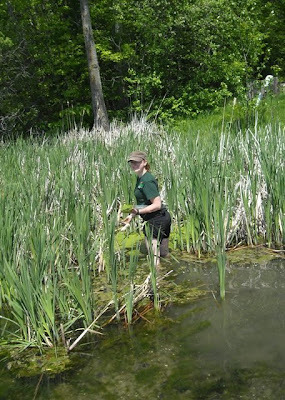 With the cold springtime we were getting nervous about finding enough duckweed to keep our ducklings healthy. Aprill pretty much just jumped on in and braved the mucky bottom to get to the duckweed and gather some. Yea Aprill! She is great...all of interns are!! We have been really blessed this year with some fine young people. 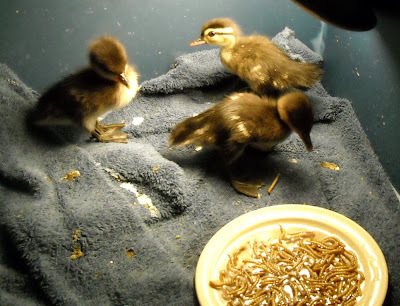 The photos shows two Merganser ducklings and a Wood Duck duckling. They are housed together at this point only because of their common age and size. Other ducklings patients of their species are older and larger and would not accept the smaller, younger babies. The merganser and wood ducks eat the same food so they are fine together at this point. When they get older they will be introduced to their own species before they are all released to the wild. 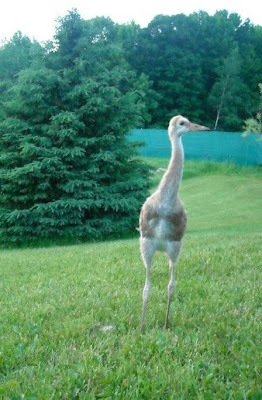 The Sandhill Crane colts are growing and changing daily. The oldest is very tall these days and while he is not flying yet he is flapping his wings in anticipation. The youngster in the photo in the flowers is FINALLY getting growing. She had some serious health issues and had retarded growth for the first few weeks. She will catch up, but so far remains behind. The oldest chick came in May 17th so is just about a month old now and the youngest is came in on May 26th. You can see their "baby pictures" on those dates in the blog. Two of our interns had birthday early this week. Lance and Natasha both turned 21! We had a great party with all of the REGI team and a beautiful cake to celebrate their milestone birthday! We are all having a great summer together. 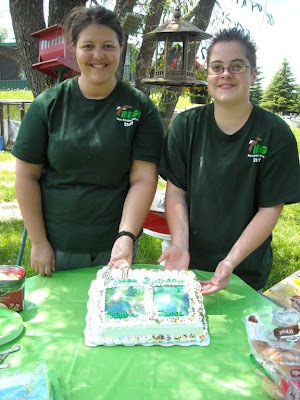 The students are terrific and work hard to make sure the birds have the best possible care. I am so grateful to them for their dedication. Until tomorrow, have a great weekend! We are glad to see the wood duck we brought in is doing great and has some friends. Our family is so thankful that you are there to help our feather friends. Keep up the great work. We are happy to see the wooduck we brought in is doing well and has some friends. We are so thankful for all you do for our feather friends.